A Victorian Flower Album is a wonderful book filled with painted flowers. The collection was created in the summer of 1873 by Henry Terry and dedicated to his children. He was a lover of nature and so were they. The book is broken up into two seasons... Spring and Summer. Next to each painting is information on the flower and if it's an annual or perennial. The paintings are lovely and educational. This would be a great book for the library of any plant lover or those who appreciate history and/or art. 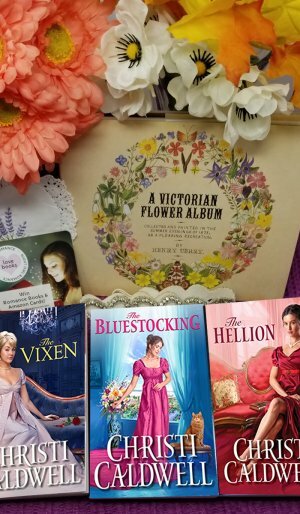 Those romance readers who want to pair a Victorian romance with A Victorian Flower Album should check out Christi Caldwell. Want to get a copy of A Victorian Flower Garden? Get it now. In the Victorian Era, one father sketched wildflowers in the hills of Oxfordshire, making notes and observations for each flower for his daughters. This title is a compilation of those charming sketches. You will find heartwarming hand-drawn flowers that still grow wild in many places today, along with a detailed glossary including each flower’s botanical name. This book can be used as a fine floral encyclopedia and is also a good reference book for designers and illustrators. A Victorian Flower Album was originally published in 1873, this new edition includes commentary by Hiroshi Unno (author/contributor for Pie International's Western art collection series).